Photo: Atkins-Jackson House, ca. 1846, Dresden Highway (Route 54), Paris, TN. 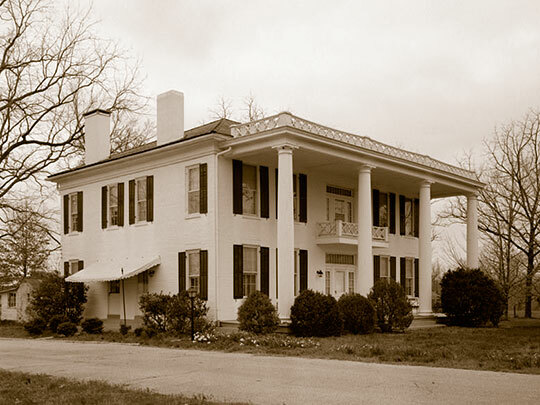 Photographed by Jack Boucher, 1974, Historic American Buildings Survey [HABS TN-180], memory.loc.gov, accessed October, 2013. Henry County Courthouse and administrative offices are located at 101 West Washington Street, Paris, TN 38242; phone: 731-642-5212. The county was created in 1821 and named for Revolutionary War patriot Patrick Henry [1736-1799]. Three Tennessee governors came from Henry County: Isham Green Harris (elected 1859), James Davis Porter (elected 1874) and Thomas Clarke Rye (elected 1915).